She kept things extremely real. A WEEK AGO, The Hollywood Reporter compiled and published a list of ‘The 40(ish) Most Powerful People in Comedy‘. It contained all of the people you’d expect it to contain – Tina Fey, Judd Apatow, Lorne Michaels and Amy Poehler, of course. The Hollywood Reporter got in touch with as many of these comedians as they could, ahead of publishing the piece, and asked them a few questions about various topics like their most memorable hecklers and dream product endorsements. College comedy audiences are… “Kids that are afraid they will be shot in their own schools. What happened to us? People on Twitter have been praising Amy’s responses. 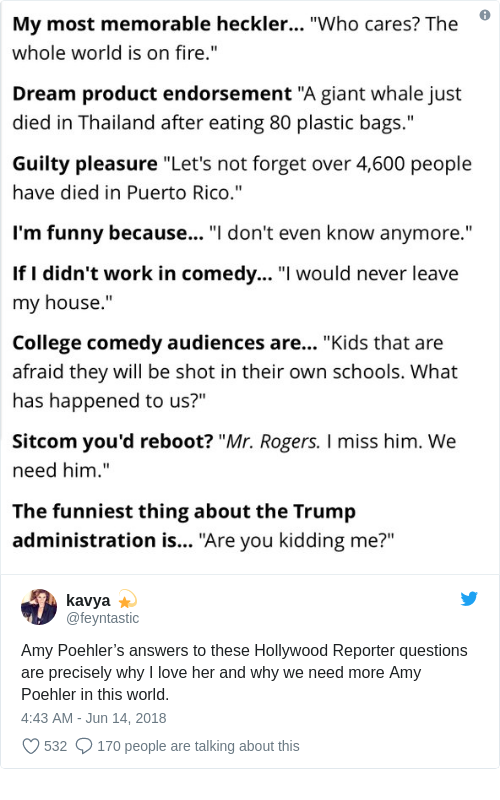 Email “Amy Poehler fans are applauding her brilliant answers in her profile as one of the world's most powerful comedians ”. Feedback on “Amy Poehler fans are applauding her brilliant answers in her profile as one of the world's most powerful comedians ”.